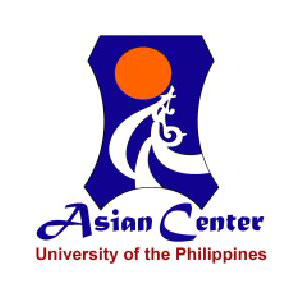 The University of the Philippines Diliman (UPD) is the flagship of the University of the Philippines System. The campus has 27 degree granting units with 376 academic programs in the clusters of the Arts and Humanities, Management and Economics, Social Sciences and Law, and Science and Technology. It has a land area of 493 hectares, which houses the academic units, the residential and dormitory areas, the resource generation zones and a protected forest area, among others. As the flagship campus of the Philippines’ national university, it is home to many critically acclaimed performing arts groups. Many successful performing artists in the contemporary art and entertainment industry began honing their crafts at UPD. The campus takes pride in the undergraduate and graduate programs focusing on the study and praxis of the performing arts and related disciplines. To date, UPD has produced 35 of the 66 National Artists. The title of the National Artist is conferred by the President of the Republic of the Philippines to Filipino individuals in recognition of his or her significant contributions to the development of Philippine arts and letters. 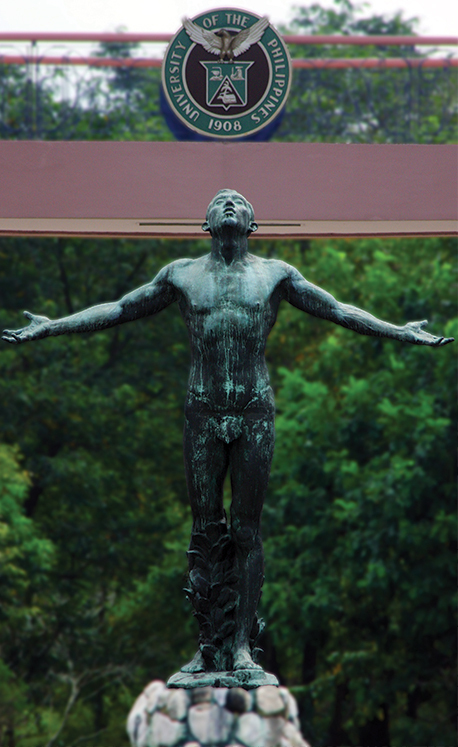 Many of the UPD landmarks and public arts are creations of National Artists. In this regard, UPD has been bequeathed with a number of creative works. Some of them were donated by the artists themselves or by donors, while others were commissioned by the University. Established in 1999, OICA is under the UP Diliman (UPD) Office of the Chancellor and is tasked to formulate policies, guidelines, plans and programs on artistic and cultural activities for the UPD Campus. 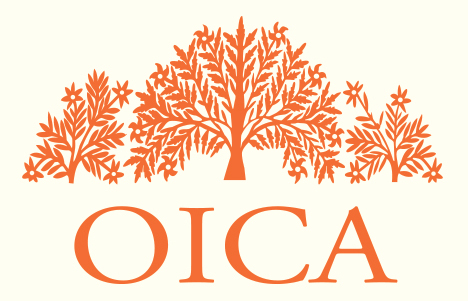 The functions and responsibilities of OICA include promoting UPD as a cultural and artistic hub; collaborating with established and emerging artists and institutions within and outside UPD; developing and sustaining cultural and artistic exchanges within the UP System and with other national and international academic institutions and artistic and cultural organizations; developing relevant research materials and archives for the benefit of UPD artists and art scholars; maintaining an active database of UPD artists from inside (current community members) and outside the University (alumni); promoting UPD's dynamic and cultural development management programs; creating and implementing policies on arts and cultural development in UPD; monitoring museums and other art exhibitions in UPD; curating institutional art and cultural exhibitions; facilitating institutional and/or cultural events in UPD; and assessing and facilitating cultural grants to UPD artists. OICA is also responsible for different institutional events in UPD. The UP Diliman Month is the most important institutional celebration that is conceptualized, produced and staged by the office. UP Diliman Month celebrates the historic transfer of UP from Padre Faura in Manila to its permanent location in Diliman, Quezon City. When the national government proclaimed February as the National Arts Month in 1991, UP Diliman Month became the University’s participation in the National Arts Month. To date, UP Diliman Month is a threefold celebration of the commemoration of the University’s transfer, the recognition of the different achievements of the University’s constituents and the University’s celebration of the National Arts Month. In 2016, UP Diliman Month was Panahon ng Luwalhati (A Season of Grace), a celebration of the birth centenary of four national artists: Manuel Conde (Film), Lamberto Avellana (Film and Theatre), Severino Montano (Theatre) and NVM Gonzales (Literature). In 2017, UP Diliman Month was Salaysayan: Kwentong Bayan, Kaalamang Bayan (Storytelling: Folk Narrative, Folk Knowledge), a celebration of Philippine oral narratives told from one generation to another during community ceremonies, rituals, and in everyday conversation and storytelling among a group of individuals. Established in 1974, DSCTA offers a certificate course (theatre arts), two basic degree programs (speech communication and theatre arts) and two graduate degree programs (speech communication and theatre arts). The graduate program in theatre arts offers two tracks: theatre studies and theatre praxis. DSCTA’s graduates hold key positions in broadcasting (radio and television) and in the performing arts (stage and film). Many others are successful professionals in their chosen field of endeavor. This is precisely due to the training within the degree program, which enables the student to develop both intellect and creative resources. The student gets immersed in both the theoretical and factual aspects of human communication and the theatre, under the scholarly guidance of the DSCTA faculty and staff who are armed with irreproachable academic backgrounds, research, know-how, and in-depth experience. The DSCTA faculty, believing that a responsible communicator has to understand the complexity of mass-as-social being, inspires the student to go beyond classroom learning. Under the DSCTA are nationally organized theater companies which have participated in international drama and theatre festivals. Dulaang UP, the cultural arm of the department, introduces the student to a worldwide dramatic repertoire and involves them in all aspects of theatre production. UP Playwrights Theatre, on the other hand, mounts full production plays written by Filipinos. Dulaang Laboratoryo stages student-directed and student-acted plays. Meanwhile, Sining Pangkabataan enhances the teaching/learning of children’s Speech and Theatre. The DSCTA faculty uses English as the medium of instruction. However, in keeping with the University Language Policy, the faculty also uses Filipino in specific courses. The DSCTA faculty strongly believes that language is instrumental to responsible and purposive communication. Uber and Grab services are available in Metro Manila. Just download the Uber and Grab apps in your gadget. Both services offer private rides. You may also share your ride with other users through their carpool services which offer a cheaper fare than the regular ride. Waze and Google Maps give the best route that consider both traffic and distance. Uber and Grab drivers use this app to navigate Metro Manila. Sakay.ph gives commuters a step-by-step transit guide which includes jeepney, bus and train. For private or rented vehicles, here are the instructions to get to GT-TOYOTA ASIAN CENTER, UP Diliman (UPD). 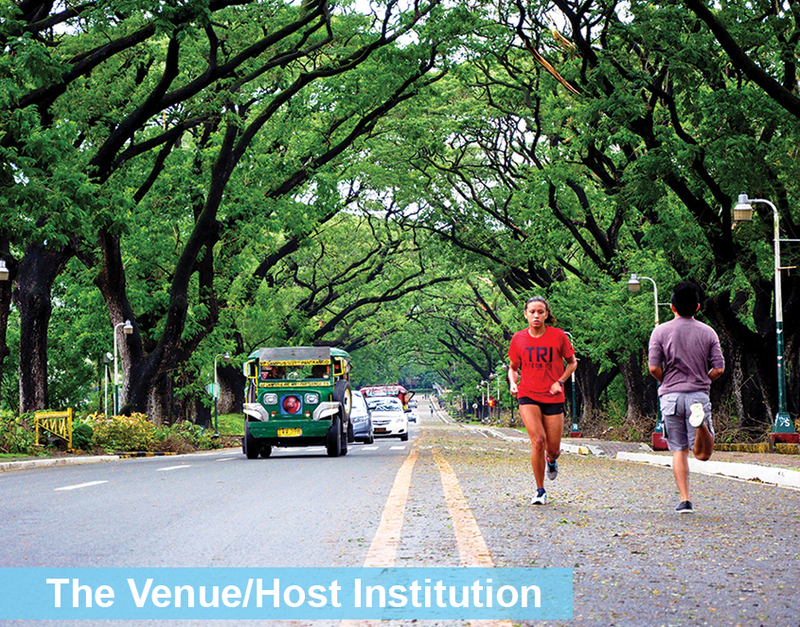 While there are several entry points to the UPD campus, only the University Avenue entry point allows access to all vehicles. Take Andrews Avenue. Continue to Sales Road. Take the exit on the left toward Metro Manila Skyway in Taguig. Keep left. Follow signs for Makati and merge onto Metro Manila Skyway. Merge onto Metro Manila Skyway (Toll Road). Take exit Magallanes to merge to South Luzon Expressway (Partial Toll Road). Take the ramp to Cubao and drive to Epifanio de los Santos Avenue (EDSA). Slight left to EDSA-Ortigas Flyover. Turn right to White Plains Avenue. White Plains Avenue turns left and becomes Katipunan Avenue. Drive along, keep left and take the Katipunan flyover. Upon getting off the flyover, you will see Ateneo de Manila University to your right. Go straight ahead and turn left at the traffic light just past Miriam College and before the UP Town Center into C.P. Garcia Avenue. Drive along the avenue and turn right at the end. You are now along the University Avenue. Straight ahead and turn left to E. Jacinto Street. Turn right to Magsaysay Avenue. Drive along and take a right before the UP Katipunan entry point (guard house). GT-Toyota Asian Center is on your right. Get on Ayala Avenue. Turn right to Paseo de Roxas then turn right to Buendia Avenue. Keep left to continue on Kalayaan Flyover. Take the ramp to Epifanio de los Santos Avenue. Go further ahead and take the flyover that crosses Ortigas Avenue. This flyover is just past Tiendesitas, which is on the left side. Straight ahead and take the Libis flyover. Take the tunnel on the left side. You are now along Katipunan Avenue. Drive along, keep left and take the Katipunan flyover. Coming from Circumferential Road 5 (more commonly known as C-5 Road) Taguig, go straight in the direction of Diliman. Get on Carlos P. Garcia Ave/C-5 in Makati. Go further ahead and take the flyover that crosses Ortigas Avenue. This flyover is just past Tiendesitas, which is on the left. Drive North and turn right just before the National Printing Office. You are now in National Office Road. Turn left at the first cross street to NIA Road. Turn left to BIR Road. Drive slight right toward Quezon Avenue. Drive straight to the end and turn right to the Elliptical Road. This road goes around the Quezon City Memorial Circle. Your exit is at Commonwealth Avenue. Turn right at Commonwealth Avenue. Turn right at the fork in the road. You are now along the University Avenue. Get on North Avenue. Drive straight to the Elliptical Road. This road goes around the Quezon City Memorial Circle. Your exit is at Commonwealth Avenue. Turn right at Commonwealth Avenue. Turn right at the fork in the road. You are now along the University Avenue. Get on Quezon Avenue. Drive straight to the Elliptical Road. This road goes around the Quezon City Memorial Circle. Regular taxi flagdown rate is Php 40.00. Pick up services have additional fees starting at Php 35.00. Operators may also give you the best option on which taxi to take. You may call Taxi Dispatch (02) 373-TAXI (8294). Taxi cabs and Uber/Grab rides are the only public vehicles allowed along C5 Road and EDSA. If you are taking a taxi cab, you may use the private/rented vehicles routes as stated above. Another option to get to the venue is to ride public utility vehicles (PUV). For commuters coming from the East (Pasig, Marikina, Rizal) and alighting at LRT-Katipunan train station, there is a jeepney terminal directly below the Katipunan flyover (corner of Katipunan Avenue and Aurora Boulevard). Take the jeepney labeled “UP Campus.” Entry point of the jeepney to UP campus is the UP-Katipunan gate. Tell the driver to drop you off at GT-Toyota Asian Center which is on the left side of the UP-Katipunan gate. Depart on to Commonwealth Avenue and ride any PUV that can drop you off at Philcoa (landmark is at Petron Station and Philcoa overpass). You may take either a jeepney labeled “UP-Philcoa” which will go inside the UP Diliman campus or cross the over pass and ride any jeepney labeled “UP-Philcoa, UP SM North, or UP-Pantranco.” The driver may drop you off at the shed near Romulo Hall. From Romulo Hall, you may walk and turn right going to GT-Toyota Asian Center which is right next to it. Commuters alighting at Centris mall, Quezon Avenue or MRT-Quezon Avenue station, may go to the jeepney terminal next to the northbound exit of the MRT station. The dispatcher can assist you which jeepney to ride. The driver may drop you off at the shed near Romulo Hall. From Romulo Hall, you may walk and turn right going to GT-Toyota Asian Center which is right next to it. SM North EDSA, a mall in Quezon City, has a jeepney terminal below the SM Sky garden for jeepneys labeled “UP-SM North.” The jeep will go inside the UP Diliman campus. The driver may drop you off at the shed near Romulo Hall. From Romulo Hall, you may walk and turn right going to GT-Toyota Asian Center which is right next to it. *Some data taken from UP Diliman website.